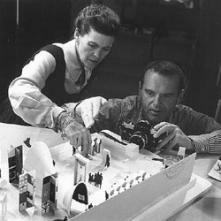 The work of husband and wife design team Charles (1907-1978) and Ray (1912-1989) Eames established a new identity for American interior and graphic design, and conceived an arena for the development of multi-media and corporate design strategy. Perennial admirers of the details of everyday life, the Eames collected hundreds of photographic images and outfitted both their home and their office with an array of folk art and objects from around the world. Their house, made from prefabricated elements, and their office, remain today as examples of an astonishingly unique and fertile breeding ground for some of the classic mid-century modern designs. Charles was born in St. Louis and studied architecture at Washington University, graduating in 1928. Throughout the 1930's he was a part of several architecture practices in St. Louis, designing houses in and around the city, as well as two churches in Arkansas. In 1936 he went to Michigan to study at Cranbrook Academy of Art and stayed there until 1940, spending the last year as a design teacher. While at Cranbrook he met Eero Saarinen and collaborated with him on the groundbreaking and award-winning "Organic Design in Home Furnishings" competition at the MoMA. Their curvy armchairs and dining chairs offered a new method of production, molding a plywood shell in three dimensions, but they hadn't yet honed their production methods, so the chairs were upholstered over these shells. Ray was born in Sacramento and studied painting at the Art Students League and the Hans Hoffman School in New York. In 1936 she helped start the radical American Abstract Artists group, lauding avant-garde art and protesting galleries with stringent and traditional policies about what to exhibit. She left New York for Cranbrook in 1940, but was only there for several months before she and Charles married in Chicago and moved to Los Angeles. In the early 1940's the Eames received the chance to experiment with new methods of bending plywood on the work they did for the Navy wartime effort. They produced plywood airplane parts and molded leg splints that were already so close to abstract art that it was no stretch for Ray to customize and exhibit them as such. They applied these techniques to their furniture design and began turning out series like the "Dining Chair Wood," known as the "DCW," the "Lounge Chair Wood" and "Lounge Chair Metal," known as "LCW" and "LCM" respectively.